An interview with Theo Hesegem, a Papuan activist working for Jaringan Advokasi Penegakan Hukum dan HAM (Law Enforcement and Human Rights Advocacy Network, JAPHAM) based in Wamena, Papua. The focus of his and his organisation's work is human rights issues that take place in the central mountain area of Papua. What happened in Wamena was actually purely criminal and has nothing to do with politics at all. Two members of a battalion hit a 10-year old boy with a motorbike and the local residents got angry because of this so they later stabbed the battalion members. The military did not accept this so they conducted an 'operation'. This 'operation', however, was excessive because it was performed up to 2 kilometres away from the location of the stabbing. The houses burnt during the attack were not owned by those who stabbed the battalion members and 14 people who were stabbed on the street had nothing to do with the incident whatsoever. The attack was brutish, houses were burnt, their windows were smashed, shops owned by non-Papuans were also set to the fire, and cars as well as motorbikes were burnt. At that time, there were actually police coming to the location but they later decided to pull out just because the military was there. I met the Komandan Kodim (Commander of the Military District Command, Dandim) later and told him that I just did not understand this. The stabbing happened in Sinakma but the 'operation' was performed up to the town and many government facilities were destroyed. I asked him to give some explanation on this but he was not able to do so. I told him as well that the guns you were given are to protect us, not to kill us. I think many countries have expressed strong concern on what is happening in Papua and this has caused some worries amongst certain people. They think, "The support is really strong, we should not let any human rights intervention to Papua." For this reason, problems were deliberately designed in Papua so people from outside will not come to Papua and just stop by in Jakarta. Problems were created so people would think, "there are too many problems in Papua so we should not go there", "Papua is not safe", "it is inconvenient to go to Papua" etc. I have heard that actually there was a team formed by the German parliamentarians who would come to Papua but due to security reasons, they could not come. Ideally, who you are and what your background is should not be relevant when it comes to law enforcement. Everybody should be equal before the law -- whether you are a President, a minister or a commander, you should not be above the law. However, this is not the case in Papua. 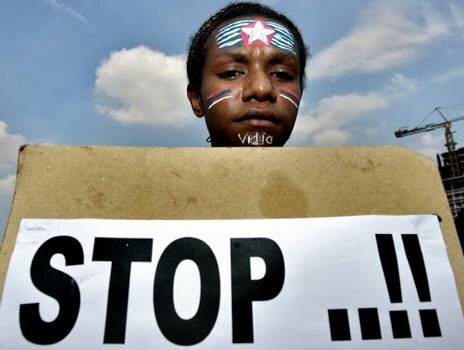 When a case involves a Papuan or some Papuans, for instance, a Papuan stole something or stabbed somebody else then it is likely that he or she would be brought before the court. Yet when it comes to cases of shootings against civilians conducted by security officers, the perpetrators would never be questioned and they would never be brought before the court. Or if they were, the punishments they receive would be very light, although the Penal Code explicitly prohibits killings. So, in Papua, the law is applicable only for civilians. Law enforcement is really weak and it takes sides. Law enforcement takes the side of those with power. Sometime ago I made a phone call from Jayapura to SCTV (one of TV stations in Indonesia) and complained to them because they said Mako was going to shoot the police officers, that was why he was shot. However, this is not what happened. I told SCTV to check first what actually has happened in the field and not just broadcast whatever information they received. I also complained to Kompas (one of the national newspapers) because they put my picture on the paper but did not include any single thing I mentioned about human rights situation and law enforcement in Papua. I just think the media in Jakarta does not make enough effort to dig the real information, they simply broadcast or publish whatever information they got. But it might be the case that there were pressures against them -- probably somebody told them what to publish. Yet I am aware that the media should be independent, the press should be free.